I was a bit worried that I had ruined the raspberries by putting them in the freezer. We had a pretty good bounty this past summer, but at the time, every berry that I didn't get to eat felt like a sacrifice of the greatest magnitude. And they looked so sad in their plastic container, frost and ice crystals forming over them, suffering the indignity of having their integrity ruptured by the expansion of the freezing juices, and getting accidentally thawed when the freezer door didn't quite shut properly. 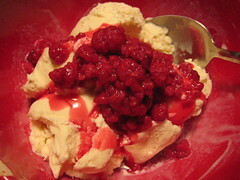 It was like you could taste a bit of summer in every bite, the snow, freezing rain and sleet outside notwithstanding. I've stumbled upon this article by Michael Pollan twice now -- once in my friend Ryan's Visualizing Science blog, and then again this afternoon, when my friend shr accidentally messaged me a link to it that he had intended to send to his lovely wife. I'm taking it as a sign of its relative significance, so I figured the least I could do was post a link to it, so here you go. A bit depressing, but a good read nonetheless.